Of all the princess type fairy tales my daughter requests me to read to her, this is the only one I can read without rolling my eyes a million times. Really, this book is perfect for us. Since we are into creating play scenes, setting up a story scene came naturally. Out of a whim, I asked Big A if she wanted to make a play scene. She gave out an excited “ Yes”. I was happy that we both were on the same page with this one..
We took our book with us and went around collecting things needed for the set up. Big flower for Thumbelina‘s house. Small leaf for her blanket. Shell of some sort for her bed. We couldn’t find any shell. So we fashioned a bed out of play dough. Her friend – worm (again from play dough). We used our play dough for her wormy friend even though Big A was keen on catching a real one to use it in the play scene. 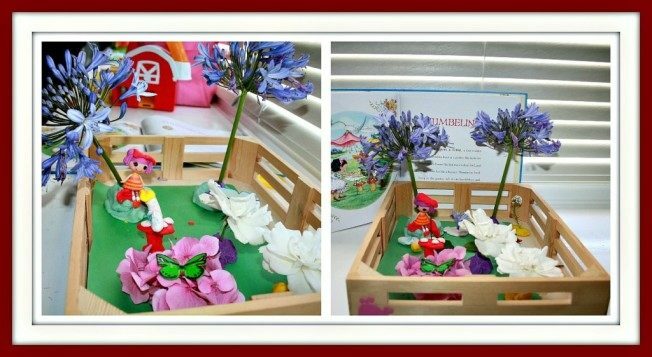 Using our wooden crate (Melissa and Doug) and some construction paper for grass, Big A set up Thumbelina ( Mini Lalaloopsy doll). She looked at the picture; fashioned her toad stool and worm by herself, complete with a tiny hat for Thumbelina. All this with play dough. She also used a flower (along with its long stalk) from the garden for Thumbelina’s chair. The flower was propped up with play dough also served as Thumbeliena’s chair. We decorated her house with more real flowers. She did not want to follow along the story but actually made up her own . I just left her to have fun with a new story and didn’t push her into following along the real one. A lesson later for another time; not when she is playing her heart out with her new set up. Once tons of new characters and imaginations were played with, she was done with the current play theme and ran off in another direction.. But the interest didn’t wear off. We came back the next day and continued with the next part of the story. 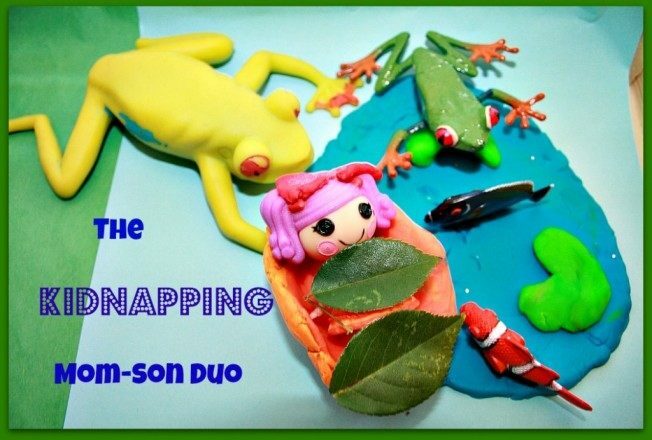 “The Big OL’ Toad Kidnap”. A blue construction paper for water, green for the land and collected all the stuff by herself. The same wooden crate , flowers and play dough. She started off with a scene where the mom is swimming by to take the poor girl to her son. Next scene , the mom- son duo are rejoicing the newly found bride. 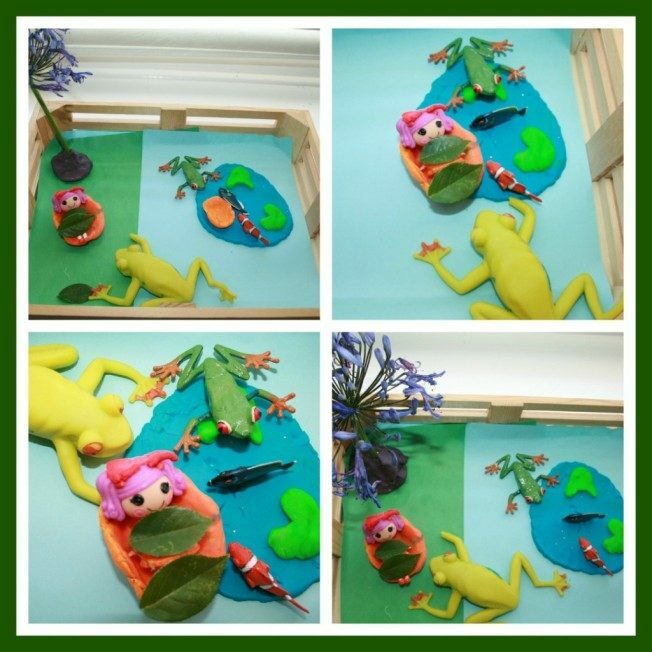 Once the toad play was set up, we retold the real story all the way till the end. But she was not too keen setting up the next scene. I think the first 2 scenes got so much play for two days I’m happy. I’m thrilled that she can also retell the entire story. May be next time, we will just the do the entire story in one scene/box like The Imagination Tree. Her stuff is too cute. She learned to model things by looking at pictures – next step (far away though) is to make/create/build things from memory. Vocabulary improvement via story building skills . Encourage critical thinking ( I ask a lot of “what if” questions. If she is up for it, she will answer. I don’t push it though.